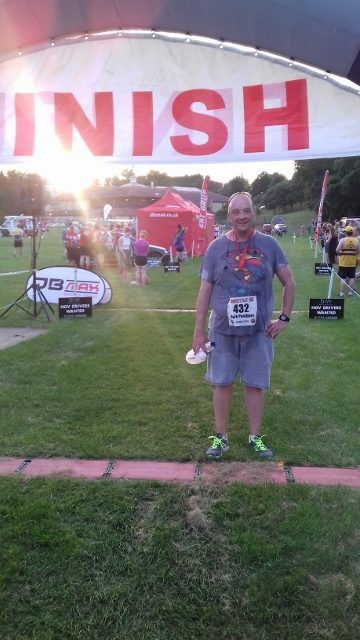 This week it’s Mark Pembury who took part in the B&W Recruitment Chippenham 10K with us. “I took up running in March 2014, one month after starting Slimming World in a bid to do something about my weight after my daughter expressed her concern. My initial target for running was to complete the Chippenham 5k river run in the July of the same year, which I did. Eight months after starting Slimming World I had lost 7 st 3 lbs and got the running bug. Something I never had before. I completed my first 10k in the October of that year (Calne Clock Tower Challenge) and did several other 10k races in the following year before running my first half Marathon (Chippenham) in September 2015. I’ve now done three half marathons in total with a target of at least two this year (Bath this year is my first) and while I’ve lost a bit of speed this year, I still get as much of a buzz as I did when I started. The Chippenham 10K was a local event that kept me on the path towards my goal this year, of two half marathons and gives my running a focus. Now that I’ve achieved my initial targets it’s now about consistently and keeping it going. I do try to spread the word on running and try to encourage people to at least try the Couch to 5k, even if all you want to do is run with a buddy “.